Yesterday we took 45 pairs of new good quality mens and ladies socks to our local homeless organisation. Winter is hard for them and although we haven't got much, there are people with nothing. We have decided from now on to collect new clothing for the homeless and give them something every month. I read in the Birmingham Mail that they have exceeded their highest targets from public donations at the food banks. That is great news. Just shows what CAN be done at grass roots level ... stepping into the void created , deliberately , by Government policy. If you like , the medical and supply corps behind the front line. Trussells ... Shelter ... take a bow ! The public face of ... the grass roots ... where they lead , others will follow. We had a chat with our local homeless organisation yesterday and they need winter gloves, men's boxer shorts and hats, but always socks. I can't sit back and not do something to help. So we will buy things as and when and when we have gathered enough, we will take it down there. Department stores are now a thing of the past. Welcome to the new department stores on the block ... FOOD BANKS !!! Jackets left on lampposts in Inverness for homeless. I have literally just read that in one of the papers online!! Another news item is that 1 in 100 children (under 18s) are homeless. Biggest news today is what Corbyn said under his breath. While the country faces its worst post world war crisis. Homeless at Christmas : " How will Santa find us ? " Rise in homelessness not our fault , says Tory housing secretary. Homeless people's deaths " Up 24%' "over five years. Someone over there reading the forum ??? 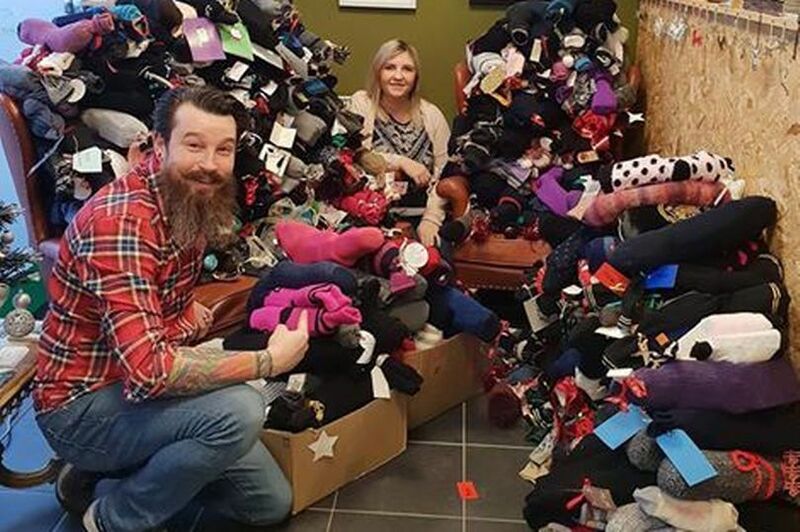 Sock appeal sees hundreds of essential items donated to homeless this Christmas. The socks, which people filled with cans of deodorant, toothpaste and other items, will be distributed to homeless people in North Staffordshire in the run-up to Christmas. Gemma Iliff launched the 'Fill A Sock Appeal - Leek' in the Moorlands to help gather donations for the Help for the Homeless CIC charity in Stoke-on-Trent - who have asked for socks containing essential goods such as toothpaste, gloves, deodorant and hand sanitiser to be distributed to the homeless this winter. Homelessness : Thousands sleeping rough in cars, Crisis says. Publishing the new research on Sunday, Crisis insisted the underlying causes of homelessness could only be tackled by changes in government policy. Homelessness increased every year between 2012 and 2017. 38,000 under-25s and 4,200 over-65s are estimated to be homeless. 170,800 households are experiencing the most extreme forms of homelessness, compared to 151,600 in 2012. This includes people who are sofa-surfing, living in hostels and rough sleeping. Crisis released the statistics as it prepares to open up its Christmas centres for homeless people. Ah . social cleansing gathers pace ... " All your problem now squire ! " ... ??? 24,000 homeless families " Sent miles from local area. " To all those part of the stats above , a merry Christmas and a prosperous New Year ... from the Government.